Mining holds a special place in the hearts of the Cornish. Its origins stretch back into the mists of antiquity. Bronze requires copper and tin so it is likely that tin, which outcrops onto the surface and can be streamed, was produced in Cornwall in the second millennium BCE. By the time the Romans were around Cornish tin was a sought after commodity. After they’d gone, the attraction of tin may help explain the arrival of ships from the eastern Mediterranean, bringing luxury goods such as olive oil and wine to the rulers of sixth century Cornwall at their tribute centre of Tintagel. Streaming remained the method of extracting tin until the 15th century, first mainly from Bodmin Moor. But then its centre of gravity moved westwards and shallow mines began to appear. The early control of the industry by merchants and financiers gave way after the Black Death of the mid-1300s to a more decentralised industry, dominated by small farmer-tinners who maintained the supply of tin. After 1337 and the formation of the Duchy of Cornwall all tin was taxed. The Duke, or the Crown in the absence of a Duke, took their cut. In return the Crown guaranteed the rights of tinners and helped to produce a tradition of the independence among tinners. The most significant of their rights were enshrined in the Stannaries. These had existed before the thirteenth century but were given formal and written charters from 1201. The Stannaries possessed their own parallel system of courts managing the industry and those engaged in it and even their own parliament, or convocation, from the 1500s. In the later 1600s the demand for tin began to grow. The small, flexible, part-time concerns that dominated Cornish tin production were well placed to grab a share of this growing market. Developments in the use of gunpowder and water power enabled shallow mines to be deepened and new underground ventures started up. In the early 1700s the expansion of the brass industry, itself stimulated by growing demand from the woollen industry for brass combs, fed back into demand for another metal – copper. Copper was found in Cornwall, often at depth under the tin lodes nearer the surface. But, to exploit these reserves, deeper mines were required and this provoked a search for more efficient drainage methods. Steam engines were introduced early in Cornish mines – from the 1730s – and that characteristic icon of the Cornish landscape, the engine house, began to multiply in the mining districts from the 1750s. Cornish engineers, encouraged by mineowners who faced high costs for the coal imported from south Wales, led the way in improving this technology and were pre-eminent by the 1810s. A booming demand for copper, not least for coins and for the expansion of the Royal Navy as the post-1707 British military-financial state threw itself into the second hundred years war with the French, resulted in the dynamic expansion of the mining industry, led by the quest for copper. 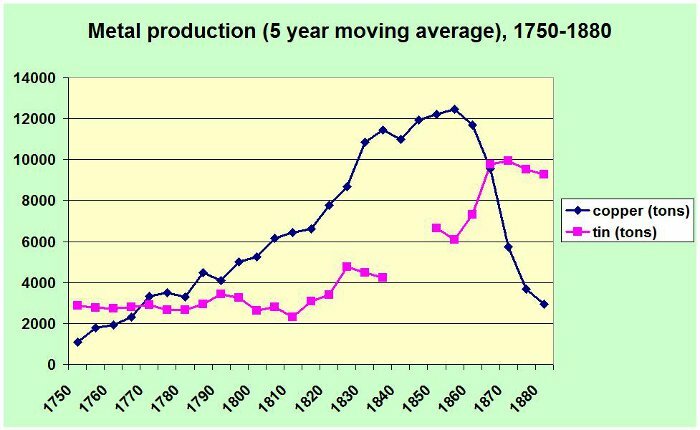 In terms of material production copper mining peaked in the 1850s. From the 1840s, in the older and deeper mines, resource depletion was becoming an issue. Nonetheless, the discovery of new copper reserves in east Cornwall and across the River Tamar in west Devon maintained production levels into the early 1860s. A banking crisis in 1866 (sounds familiar) triggered a price crash however, and production of copper then plummetted catastrophically. By the 1890s production of that mineral was negligible. Cornish mines were now again dependent on tin, the production of which peaked in the early 1870s, although arsenic and other minerals helped to cushion the fall. The geography of mining also underwent a major shift in the late 19th century. Recurrent crashes in the price of metals, and particularly tin – notably in the mid-1890s, the early 1920s and the 1980s – punctuated a long drawn out decline of mining in Cornwall. The graph below shows the value of Cornish mining before 1914 once price changes have been factored in. The peak in the 1850s and 1860s can be clearly seen. Even this understimates the value from the industry as income from lead-silver production is not included. This rose and fell in one generation, from the 1840s to the 1870s, and its height in the 1850s and early 1860s added around 10% to the value of Cornish mining. In 1998 Cornwall’s last tin mine, South Crofty, closed. But reports of the death of Cornish mining may be premature as plans to restart production at this mine and even open others can still circulate.